At White Oak Pastures, we are always looking for ways to better the land, animals, and people. This mission doesn’t stop when it comes to looking for creative ways to serve our devoted, passionate customers. Over the last 150+ years, we’ve been breeding our cattle for their maternal instincts because we understand how important certain genetic qualities truly are. Since we started marketing meat and poultry to the end customer, we’ve also tried to select animals that have adequate marbling and other taste features. At the end of the day, we know that our customers are the ones we must please, which has kept us marching down a path to find the perfect combination breed to give customers exactly what they want: the Porken. 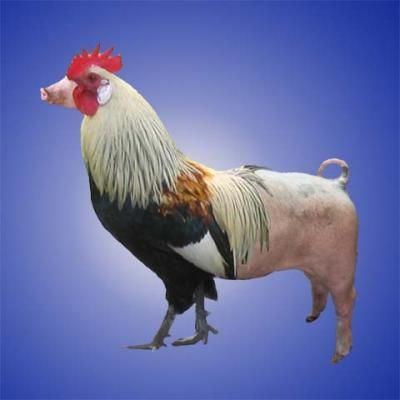 A holy union of poultry and swine, the Porken has two claw-like feet and two hoofed. “Regenerating depleted soil is our passion. We depend upon animal impact to bring biological life back to land that has been degraded for decades by cultivation, pesticides, chemical fertilizers, and other modern production tools. The Porken is a breakthrough for us. It pecks, scratches, roots, and graze, all in the same pass while replenishing the soil with copious quantities of manure. Porkens are the Nuclear Device of Land Regeneration,” owner Will Harris comments. The meat is like nothing you’ve ever had before, a mix of lean white meat poultry, mixed with the delicious flavor of pork. The muscle to fat ratio is approximately 95/5 on the front end of the animal, and 70/30 on the back, which gives every diner a place at the Porken table. “Our biggest hurdle was identifying the facility to process this new jewel in. We agreed that the breezeway between the red meat and poultry facility was the only option,” stated Brian Sapp, the White Oak Pastures Director of Operations. If you’ve shopped in our online store, you might have noticed frequent “out of stock” flags on some of our most popular cuts. While we appreciate any opportunity to share the meat and poultry we raise and butcher on our farm, like many farms, struggle to keep certain items in stock. “Managing inventory with a vertically integrated production system proves challenging day after day. To fill the levels we need on one item, we become endlessly overstocked in others,” says Jenni Harris, Director of Marketing. Jean Turn, White Oak Pastures Comptroller states "The normally mild-mannered accounting staff has split into two militant camps over how to classify the porken. Emotions are hostile between those who consider it the 11th species and those who want to put it in with our specialty products." It takes about 12 weeks to raise and finish a Porken on pastures. At this time, we are only able to take pre-orders for breasts, chops, feet, and hams. To be placed on the wait/preorder list, please email us at info@whiteoakpastures.com. We are excited to continue to lead the industry by using animals as tools to regenerate land, but also breaking through the norms of traditional livestock breeds. We know there’s a place for a Porken on every farm in the United States. 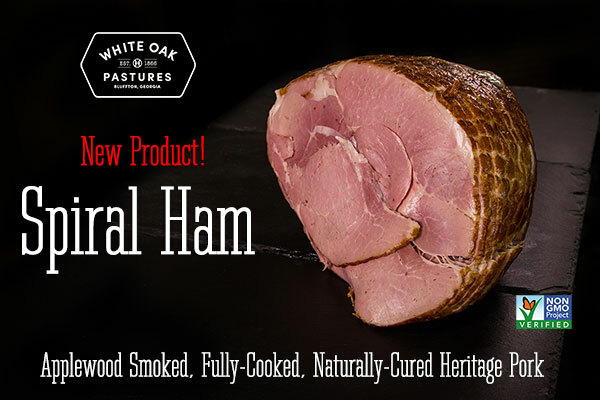 Celebrate your next special occasion with a delicious, fully-cooked, smoked spiral ham! These uncured half hams are applewood smoked and made from our non-GMO, pasture-raised, heritage pork.